So often when we start cutting into a vegetable we simply whack it in half, thinking that's a reasonable first step, and then we fumble around. Well... leave it to the French to figure out the best and most efficient way of cutting into anything; bell peppers included. Here's one of those things I learned the first week of cooking school that drove me crazy initially but I appreciated later on. Take a look at your pepper. Most of the time (but not always) a bell pepper has four walls (sides). Sometimes there will be only three and sometimes there may be five or six narrower walls. Whatever the number it doesn't matter because the principal is the same. One frustration with cutting a pepper is that you generally get curled up ends that are hard to control with the knife. So to avoid that we are going to cut off the walls which will give you flat pieces to cut from. Take your chef's knife and remove one of the walls (sides) trying not to cut deep into middle but staying close to the edge. Then go around the pepper cutting off the remaining walls. Take the stem part and with a paring knife work around the stem removing any usable amount and then chop that into small pieces. You should be left with four flat pieces (which were the walls), a bottom section and also a top section. If you had more walls then you will have more flat pieces just smaller in width. Now you can take each piece and cut them either crosswise or lengthwise depending on your needs. 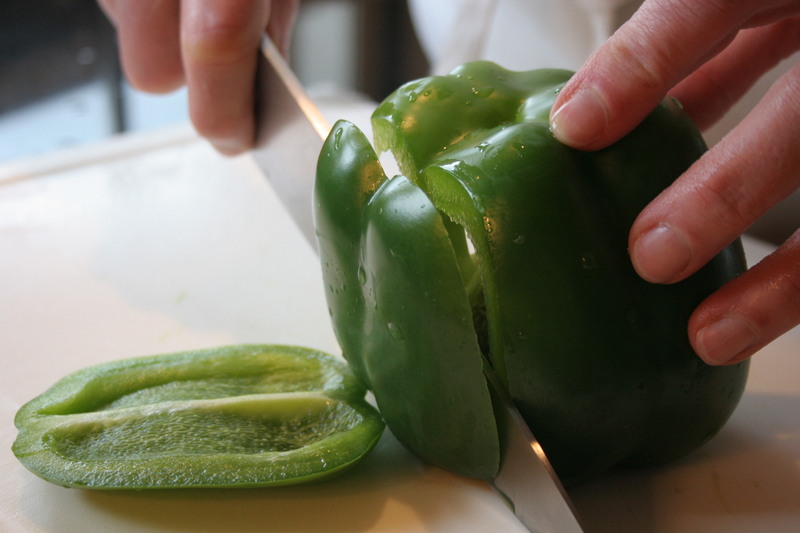 If you want diced peppers simply cut the strips once again, crosswise in the size you want. Take the remaining bottom section and strip it out in the same way. That's it!